Although the Avengers survive a strike by Crossbones on Lagos, dozens of civilians are killed in the altercation. As a result, the team is presented with the Sokovia Accords - an agreement designed to keep the heroes in check - and must individually choose which side of the law they stand with. Yep, that's Civil War alright! While there are a lot of single figures in this numbered line, this is a two-pack. America's first super soldier, Captain America must decide if he stands by his government in the aftermath of a disastrous strike on Lagos, Nigeria. We've reviewed so many movie Captain America figures that some of them have even been relegated to the blog (our home of "let's do it quick and dirty" reviews), so clearly Cap isn't the draw of this set. 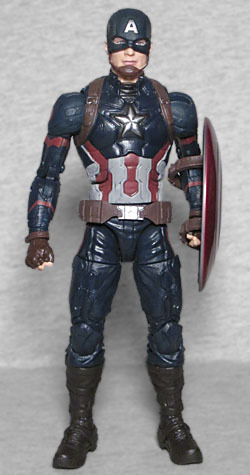 This figure's body is the same one we've seen a few times - including, of course, the existing Civil War Captain America figure (and the battle-damaged variant). It's a nicely detailed sculpt, but it wasn't movie-accurate the first time they released it, and it hasn't gotten any more accurate in the intervening years. Still, it's not bad enough for us to call it bad, it's just not as good as a completely new sculpt might have been. That said, there's at least one thing new, and it's worth getting: the head. Both heads, in fact! 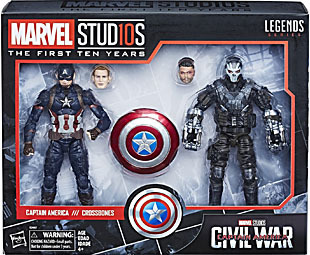 For whatever reason, it seems like Hasbro didn't get the likeness rights for Chris Evans; before Infinity War, the only unmasked Steve Rogers head came from Winter Soldier, and that was just a generic blond guy - this toy is a full-on high quality Chris Evans sculpt, even using the new face-paint-printing technology to make him the best best it can be. And the masked head doesn't get shorted, either: rather than being a reused sculpt, this is a new one with the mask part done as a separate piece glued onto the head, giving it a realistic depth the same way NECA's Lone Ranger did. This is less necessary than the bare head, but it's good. The shield is new, too. Unlike the mold we usually see, this one has a star in the center that is flat with etched-in lines, rather than angled to a raised point in the middle. 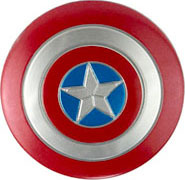 The only other Captain America figure to have that kind of shield was the WWII version, and this accessory has a larger diameter than that one did. The paint is metallic, with silver and a candy apple red that would look perfectly at home on a hot rod. If you look at the inspiratorial scene, you'll see that half the face of the shield should be blackened, but it's clear why Hasbro wouldn't want to do it that way (and why fans wouldn't want it to be done that way). A Hydra agent and former double-agent at SHIELD, Crossbones makes it his mission to take out Captain America, no matter the loss of life at stake. And here we have the figure anyone cares about from this two-pack. Crossbones was another Marvel villain who ended up nearly wasted in the movies. Granted, when it comes to being a throwaway, he's no Baron Strucker (the current king of "why even bother? "), thanks to getting some setup in Winter Soldier before a payoff in Civil War, but the MCU's willing rapidity in killing off its villains means that a guy who, in the comics, has been one of Captain America's most enduring, troublesome foes, gets swept unceremoniously off the board before really getting to show off what he can do. Hey, at least we've still got Batroc the Leaper out there somewhere, right? 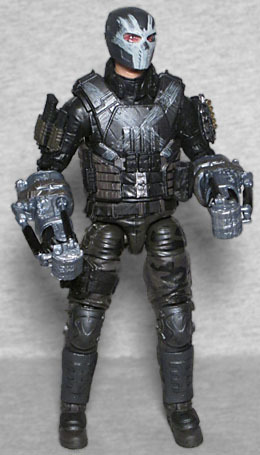 There was a nod to Brock Rumlow's future villainous identity in Winter Soldier, when he took off his vest and revealed the straps crossed across his chest, but Civil War took it all the way, giving him a suit of tactical armor that he's customzed with a skull-and-crossbones theme. The paint on this figure is a little too light: you can see it on his mask easily enough, but on his chest it looks faded. The underlying outfit looks totally like something a soldier or mercenary would wear, he's just accessorized it with extra protection that will help him stand up to a man who's chemically endowed. He has a pistol on his right leg, and lots of ammo strapped to his arms. He looks very threatening... even if he should have better paint on his chest. He's of course armed with the mechanical gloves that augmented his punches. 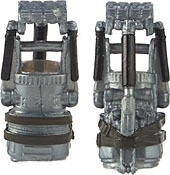 They're single, unarticulated pieces, but they are separate accessories, which means the molds could be reused for a Homecoming Shocker, if Hasbro were so inclined. Or you, if you feel like customizing your own Bokeem Woodbine. 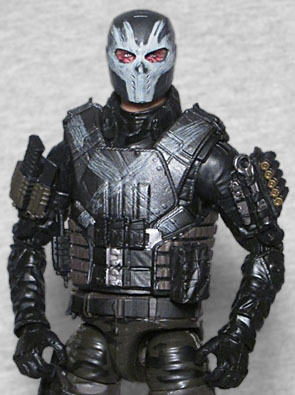 Like Captain America's masked head, Crossbones' is done as two pieces: grey plastic for the helmet, and pink for the skin. Yes, despite the fact that the eyes are the only skin visible. The set includes a second, unmasked head for him, allowing us to see Rumlow's burnt, scarred face. The likeness of Frank Grillo is good, though it could have used some more paint to bring out all the scars May Thamtarana sculpted on there. 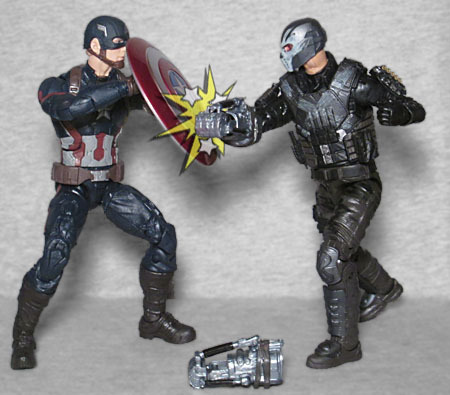 It would unquestionably have been preferable to get a Crossbones figure without having to buy another Captain America figure along with him, but the inclusion of two new, fully licensed heads and a shiny new shield make that figure more desirable than expected. The Marvel Studios figures are about 25% more expensive than regular Marvel Legends, which is a hard pill to swallow when the action figures we buy are already damn expensive as it is. But the multi-layered heads show that the price increase is going to pay for things other than fancy packaging.